The International 2018 (TI8) was the eighth iteration of The International, an annual Dota 2 world championship esports tournament. Hosted by Valve Corporation, the game's developer, TI8 followed a year-long series of tournaments awarding qualifying points, known as the Dota Pro Circuit (DPC), with the top eight ranking teams being directly invited to the tournament. In addition, ten more teams earned invites through qualifiers that were held in June 2018, with the group stage and main event played at the Rogers Arena in Vancouver in August. The best-of-five grand finals took place between OG and PSG.LGD, with OG winning the series 3–2. Their victory was considered a Cinderella and underdog success story, as they had come from the open qualifiers and were not favored to win throughout the competition. As with every International from 2013 onwards, the prize pool was crowdfunded by the Dota 2 community via its battle pass feature, with the total being over US$25 million, making it one of the largest for any esports tournament. Other events took place during the tournament, including a cosplay competition and submitted short film contest with their own independent prize pools, as well as two live demonstration games of a team of professional players playing against a team of five OpenAI-curated bots, known as the OpenAI Five, to showcase the capability of machine learning. In addition to nearly 20,000 spectators at the Rogers Arena, the tournament was livestreamed and seen by over 15 million people online. A documentary film following OG and PSG.LGD during the grand finals was released in January 2019. Dota 2 is a multiplayer online battle arena (MOBA) video game developed by Valve Corporation, which released in 2013. In it, two teams of five players compete by selecting pre-designed in-game hero characters, each with a variety of innate skills and abilities, and cooperating together to destroy the base of the other team before their own base is destroyed as to win the round. The game is played from a top-down perspective, and the player sees a segment of the game's map near their character as well as mini-map that shows their allies as well as any enemies revealed outside the fog of war. The game's map has three roughly symmetric "lanes" between each base, with a number of defensive towers protecting each side. Periodically, the team's base spawns a group of weak CPU-controlled creatures, called "creeps", that march down each of the three lanes towards the opponents' base, fighting any enemy hero, creep, or structure they encounter. If a hero character is killed, that character respawns back at their base after a delay period, which gets progressively longer the farther into the match. As with previous years of the tournament, a corresponding battle pass for Dota 2 was released in May 2018, allowing the prize pool to be crowdfunded by players of the game. Known as the "Compendium", 25% of revenue made by it was sent directly towards the tournament's prize pool, which Valve started at a base US$1.6 million. At the time of event, Dota 2 featured 115 playable characters, called "heroes". Prior to each game in the tournament, a draft was held between the opposing team captains to select which heroes their teams use, going back and forth until each side has banned six and selected five heroes. Once a hero is picked, it cannot be selected by any other player that match, so teams used the draft to strategically plan ahead and deny the opponent's heroes that may be good counters or would be able to take advantage of weaknesses to their current lineup. The first pick in a match is decided by an in-game coin toss, and switches between each game in that match; the team that does not get first pick get the option of which side of the map to play on, of which doing so has strategic benefits. As with traditional sporting events, the tournament featured pre- and post-game discussion by a panel of analysts (top), with in-match casting being done by play-by-play and color commentators (bottom). A change from previous Internationals, The International 2018 featured a series of tournaments running from October 2017 until June 2018, known as the Dota Pro Circuit (DPC), that awarded qualifying points with the top eight ranking teams receiving direct invitations. 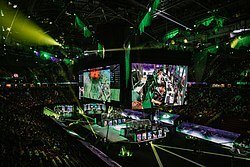 For the first time since The International 2013, the main event was not held at the KeyArena in Seattle, due to it undergoing renovation construction at the time, and was instead held at the Rogers Arena in Vancouver, Canada from August 20–25. The event was also broadcast on a number of livestreams, such as on Twitch and Steam.tv, with the latter being introduced specifically for the tournament. 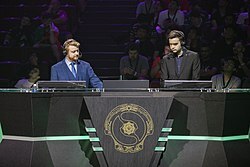 As with most major Dota 2 tournaments, the event had English, Chinese, and Russian-language broadcasting crews, with all of them having a large group of dedicated analysts and game casters. The eight DPC teams to earn invites were Virtus.pro, PSG.LGD, Team Liquid, Team Secret, Mineski, Vici Gaming, Newbee, and VGJ.Thunder. In addition, twelve open qualifier single-elimination playoff brackets, two from each region, were held from June 14–18, 2018, with any eligible team able to participate in them, including non-professional ones. Winners of them advanced to the main qualifiers, which were held from June 18–25 and consisted of six regional brackets where an additional ten teams, Team Serenity, Invictus Gaming, Winstrike Team, OG, VGJ.Storm, Evil Geniuses, OpTic Gaming, paiN Gaming, Fnatic, and TNC Predator, earned invites by winning their respective regions. To seed the elimination bracket for the main event, two separate round robin group stages featuring all 18 teams were played from August 15–18. Each of the teams played each other within their group in a two-game series, earning points based on their results. The top four placing teams of each group advanced to the upper bracket, while the fourth through eight advanced to the lower bracket. The lowest placed team from both groups were eliminated from the competition. The main event featured two brackets, an upper and lower, in a double-elimination tournament format. Winning teams of the upper bracket, played in a best-of-three match format, advanced to the next round, while the losing team would then be placed in respective rounds of the lower bracket. The winner of the upper bracket moved to the grand finals. Teams who were seeded into the lower bracket from the group stage played best-of-one games, with the loser being immediately eliminated. All later round matches in the lower bracket were played to best-of-three, with the winner of the lower bracket advancing to the grand finals, played as a best-of-five series, to face the winner of the upper bracket. The best-of-five grand finals took place between OG and PSG.LGD, with OG winning the series 3–2. While PSG.LGD earned an direct invite to the tournament by finishing third in the 2017–2018 Dota Pro Circuit standings, OG earned theirs by playing through and winning the European open qualifiers, which they were required to do per tournament rules following a roster shuffle after three members, Tal "Fly" Aizik, Gustav "s4" Magnusson, and Roman "Resolut1on" Fominok left the team in May 2018. Needing three new members just two weeks before the qualifiers began, OG quickly signed Topias "Topson" Taavitsainen, a newcomer to the scene who had never performed at a major LAN event prior to the event, Anathan "ana" Pham, a former member of the team who had taken a year-long break following their previous elimination at The International 2017, and Sébastien "Ceb" Debs, who had previously served as the team's coach. Following their win at the European qualifiers, OG were then placed into group A, finishing fourth with a record of 9-7, which seeded them into the upper bracket. There, OG won every series to advance to the grand finals. Facing the lower bracket winner PSG.LGD in it, whom OG had just defeated in the upper bracket finals, OG won the game one, but lost the next two games. Needing another win to avoid losing the series, OG forced a late-game comeback in game four, and subsequently won game five, making them International champions and winning them over US$11 million in prize money. Their victory was considered a Cinderella and underdog success story, as they had come from the open qualifiers and had beaten some of the more favored and accomplished teams along the way. Their win also broke the historical trend of Chinese teams winning the International in even years. At the time, the prize pool set an esport prize pool record by eclipsing the previous years' record, finalizing at US$25,532,177. Other related events took place during the tournament, such as a cosplay and submitted short film contest with their own independent prize pools. In addition, two live demonstrations of a team of professional players playing against a team of five OpenAI-curated bots, known as the OpenAI Five, took place to showcase the capability of machine learning. Although the bots lost both games, the first against paiN Gaming and the second against an all-star team of former Chinese players, they were considered a success by OpenAI who stated that due to the bots playing against some of the best players in Dota 2, it allowed them to analyze and adjust their algorithms for future games. Attendees of the event at the Rogers Arena were given a free copy of Artifact, a then-upcoming digital collectible card game based on Dota 2. New content for the game itself was also revealed during the event, including two new playable heroes and a Gabe Newell voice pack. The tournament was seen by over 15 million people online, with nearly 20,000 attending the matches at the Rogers Arena. The tournament, alongside OG's upset win over PSG.LGD, were respectively nominated for "best esports event" and "best esports moment" at The Game Awards 2018 ceremony. An episode of True Sight, Valve's documentary film series on the professional Dota 2 scene, was filmed during the event. It followed OG and PSG.LGD during the grand finals, documenting a number of behind the scenes moments for both teams before and after matches. It was released online for free on January 15, 2019, and also premiered to a live audience at the Palads Teatret in Copenhagen with members of OG as special guests. ^ a b Gies, Arthur (August 2, 2017). "The Normal Person's Guide to Watching Competitive Dota 2 (2017 Edition)". Polygon. Archived from the original on August 3, 2017. Retrieved August 16, 2017. ^ Kim, Ben. "A comprehensive comparison of Dota 2 and League of Legends". PC Gamer. Archived from the original on August 1, 2016. Retrieved August 3, 2016. ^ Rose, Victoria. "The Battle Pass for The International 8, Dota 2's biggest tournament, has arrived". The Flying Courier. Polygon. Archived from the original on May 9, 2018. Retrieved May 9, 2018. ^ a b c Parker, Jason. "How to watch Dota 2's The International, the biggest esports event of the year". CNET. Archived from the original on August 18, 2018. Retrieved August 17, 2018. ^ Dota Team. "The International 2018 Battle Pass". blog.dota2.com. Archived from the original on May 10, 2018. Retrieved May 9, 2018. ^ a b McAloon, Alissa. "Valve's nearly $25M The International prize pools sets esports-wide record". Gamasutra. Archived from the original on August 20, 2018. Retrieved August 20, 2018. ^ Rose, Victoria. "Here are the top eight Dota Pro Circuit point winners so far". The Flying Courier. Archived from the original on April 23, 2018. Retrieved April 22, 2018. ^ Gach, Ethan. "Valve Announces Big Changes To Dota 2's Tournament Structure Going Forward". Kotaku. Archived from the original on July 10, 2017. Retrieved July 4, 2017. ^ "The Dota Pro Circuit". blog.dota2.com. Archived from the original on September 16, 2017. Retrieved September 15, 2017. ^ Rose, Victoria. "The International 8 to take place August 20–25 in Vancouver". The Flying Courier. Polygon. Archived from the original on March 16, 2018. Retrieved March 16, 2018. ^ Rose, Victoria. "Valve: TI move to Vancouver is due to Key Arena construction plans". The Flying Courier. Polygon. Archived from the original on April 1, 2018. Retrieved March 31, 2018. ^ Wilde, Tyler. "Valve's new streaming platform, Steam.tv, is officially live now". PC Gamer. Archived from the original on August 21, 2018. Retrieved August 20, 2018. ^ Rodriguez, Veronika. "Valve Reveals Dota 2 TI8 Broadcast Talent". dbltap.com. Archived from the original on August 2, 2018. Retrieved August 2, 2018. ^ Rose, Victoria. "Here are the first eight teams attending The International 8". The Flying Courier. Polygon. Archived from the original on June 10, 2018. Retrieved June 9, 2018. ^ Rose, Victoria. "The International 8's qualifier, group stage dates revealed in Compendium". The Flying Courier. Polygon. Archived from the original on May 15, 2018. Retrieved May 14, 2018. ^ Rose, Victoria. "The International 8 qualifiers, format announced". The Flying Courier. Polygon. Archived from the original on June 10, 2018. Retrieved June 10, 2018. ^ Rose, Victoria. "The International 8 Qualifier schedules, news and more". The Flying Courier. Polygon. Archived from the original on June 19, 2018. Retrieved June 18, 2018. ^ Mejia, Ozzie. "These Are the 18 Teams Competing in the 2018 Dota 2 International". Shacknews. Archived from the original on June 26, 2018. Retrieved June 27, 2018. ^ Rose, Victoria. "The International 8 groups, format and schedule for group stage". The Flying Courier. Polygon. Archived from the original on August 13, 2018. Retrieved August 13, 2018. ^ Rose, Victoria. "The International 8's main event schedule, results". The Flying Courier. Polygon. Archived from the original on August 19, 2018. Retrieved August 19, 2018. ^ a b "Standings - Group Stage". dota2.com. Archived from the original on August 14, 2018. Retrieved August 18, 2018. ^ a b Rose, Victoria. "The International 8 group stage results, main event bracket". The Flying Courier. Polygon. Archived from the original on August 19, 2018. Retrieved August 19, 2018. ^ a b Rose, Victoria. "OG Dota win The International 8 for $11 million top prize". The Flying Courier. Archived from the original on August 26, 2018. Retrieved August 26, 2018. ^ a b c O’Keefe, David. "OG fill us in on their epic TI8 victory". Red Bull. Archived from the original on August 26, 2018. Retrieved August 26, 2018. ^ a b c Gach, Ethan. "Tournament Underdogs Won This Year's Dota 2 International". Kotaku. Archived from the original on August 27, 2018. Retrieved August 27, 2018. ^ "OG beats PSG.LGD in winners bracket thriller; Evil Geniuses advances". ESPN. Rotoworld. Archived from the original on August 26, 2018. Retrieved August 26, 2018. ^ a b c d "OG wins five-game thriller to take The International 8 title and $11 million". ESPN. Rotowire. Archived from the original on August 27, 2018. Retrieved August 26, 2018. ^ a b c Strom, Steven. "Dota 2 championship ends in a pulse-pounding, curse-breaking Cinderella story". PC Gamer. Archived from the original on August 26, 2018. Retrieved August 26, 2018. 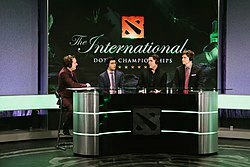 ^ "Dota 2 - The International". dota2.com. Archived from the original on May 5, 2018. Retrieved August 20, 2018. ^ Div. "TI8 Cosplay Contest Announced With $15,000 Prize". vpesports.com. Archived from the original on June 25, 2018. Retrieved June 25, 2018. ^ Rose, Victoria. ""On The Cliff" wins Dota 2 Short Film Contest 2018, takes $25,000 grand prize". The Flying Courier. Polygon. Archived from the original on August 25, 2018. Retrieved August 25, 2018. ^ Rigg, Jamie. "AI isn't good enough to beat the best 'Dota 2' players just yet". Engadget. Archived from the original on August 27, 2018. Retrieved August 27, 2018. ^ Marks, Tom. "Artifact Beta Announced for Later This Year". IGN. Archived from the original on August 20, 2018. Retrieved August 20, 2018. ^ Rose, Victoria. "Two new Dota 2 heroes are coming — and one is out tonight". The Flying Courier. Polygon. Archived from the original on August 25, 2018. Retrieved August 25, 2018. ^ Horti, Samuel. "Gabe Newell comes to Dota 2 in wonderfully deadpan voice pack". PC Gamer. Archived from the original on August 26, 2018. Retrieved August 26, 2018. ^ Pierson, David; Dean, Sam. "Rapidly growing world of e-sports confronted by tragedy of Jacksonville shooting". Los Angeles Times. Archived from the original on August 28, 2018. Retrieved August 27, 2018. ^ Crowd, Dan (December 6, 2018). "The Game Awards 2018: All The Winners". IGN. Archived from the original on December 7, 2018. Retrieved December 6, 2018. ^ Wells, Adam. "True Sight Reveals Everything About The International 2018 Finals". Kotaku. Archived from the original on January 17, 2019. Retrieved January 17, 2019. Wikimedia Commons has media related to The International 2018.